Why Are Ambrosia Apples so Slow to Brown? One of the things that people know about Ambrosia apples is that they’re slow to turn brown after being cut. 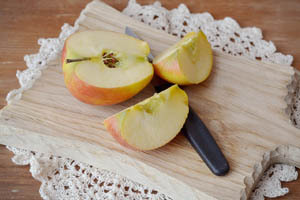 This is great for preparing apple slices before you’re ready to eat them – for example, when preparing a snack for kids. First, let’s look at what causes cut apples to change colour. There is a very complex scientific explanation, in this Scientific American article. To simplify things, here’s our layman’s explanation. All apples contain phenolic compounds that react to air. More specifically, when polyphenol oxidase enzymes are exposed to oxygen they start to change into new enzymes that present with a brownish colour. The longer these enzymes are exposed, the browner they become. All natural apples contain plyphenol oxidase (PPO). Now that we understand (more or less) the science behind what’s going on, it leads us to our original question; why don’t Ambrosia apples brown as fast as other apples? The speed at which apples brown depends, primarily, on how much PPO they contain. Ambrosia have a lower level of that enzyme. So, when an Ambrosia apple is cut and the flesh is exposed to oxygen, the browning process does begin, but at a much slower pace. Because there is less of the enzyme to react to the air, the oxidation process takes longer. Many people know that squeezing lemon over an apple slice helps to slow the browning process. This is because lemons have a low pH level which slows down the polyphenol oxidase process. Don’t do it with Ambrosia apples! As we said, Ambrosia apples already have less active polyphenol oxidase, and adding lemon will just hide their honey-sweet flavour.